Scholarship America’s founder, Dr. Irving Fradkin, received a congratulatory telegram from President Eisenhower as he began expanding his community-scholarship idea across New England more than 50 years ago. One of the first donations to our national organization came from former First Lady Eleanor Roosevelt. And, this week, Scholarship America renewed our connection to the White House: Max Espinoza, our Senior Vice President of Education Programs and Policy, joined education leaders and student advocates at the White House for two major events. These events are important milestones for our organization — and even more important for America’s students. 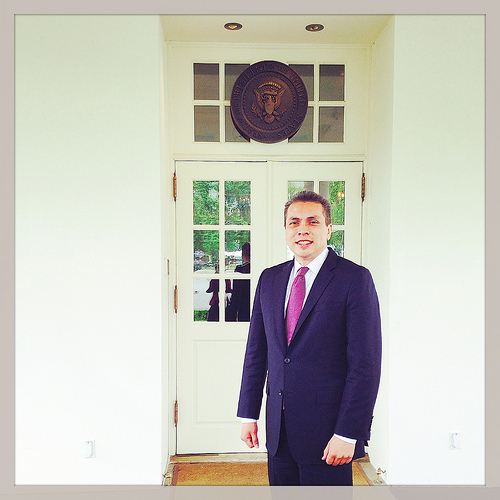 On Monday, Max represented Scholarship America at the White House, and was given the rare and unique opportunity to meet President Barack Obama in the White House Blue Room. 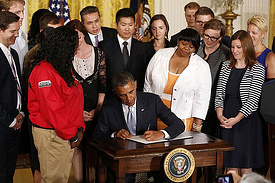 In addition, Max stood with President Obama on stage in the East Room, as he delivered a nationally televised speech on college affordability and signed an executive order providing student loan borrowers badly needed relief on their student loan payments. The centerpiece of the president’s executive action, according to Boston.com, is an order “allow[ing] millions of previously ineligible student debtors to qualify for the ‘Pay as You Earn’ repayment program, which caps payments on student debt at 10 percent of monthly income and forgives outstanding balances after 20 years of repayments.” The executive order also provides for a renegotiation of contracts with Sallie Mae and other federal loan servicers to better support students in paying back their loans, and outlines strategies for ensuring that students can make better-informed borrowing decisions. The president’s speech (which you can watch on the White House YouTube channel) and the memorandum containing his executive actions highlight the need to continue tackling college costs and the student loan crisis around the country. 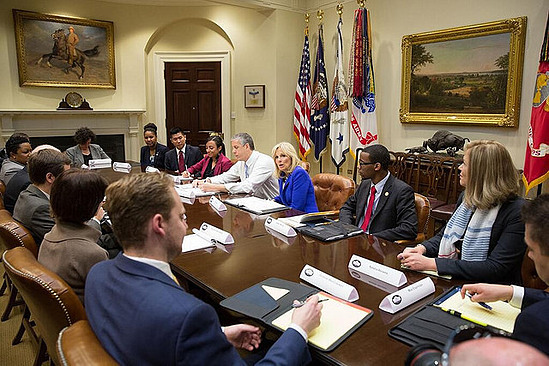 Max’s appearance alongside President Obama was the culmination of a series of events, including a small, intimate meeting last week that Max attended in the Roosevelt Room of the White House with Dr. Jill Biden, the Second Lady of the United States, and U.S. Secretary of Education Arne Duncan. Along with 12 other education advocates — professors; university presidents; student and fellow nonprofit leaders – Scholarship America was invited to share our ideas of how to tackle college affordability across the country. He explained our two major areas of focus: Dollars for Scholars, which allows individual grassroots affiliates to fund local students; and Scholarship Management Services, which designs and manages custom education assistance programs for corporations, foundations and individuals that reach students all over the world. Our unique model resonated with the attendees; Dr. Biden had several follow-up questions about the Dollars for Scholars model, and one college president in attendance referenced the power of scholarships in getting students to attend and get through her college, especially underserved and non-traditional students who generally needed additional support. The White House invitations for both events came as Max was doing field visits with Dollars for Scholars affiliates in the New England region, where Scholarship America originated. He was accompanied on visits to Stamford Dollars for Scholars and Woodbury Scholarship Fund Dollars for Scholars by Lynne Zervas, Scholarship America Area Director, and reported being inspired by “the passion, commitment and accomplishments of these chapters.” Max took their stories with him to the White House – along with the stories of the thousands of volunteers and stakeholders across the country who partner with Scholarship America, to ensure everyone has the opportunity to achieve a postsecondary education and the American Dream. As President Obama said in yesterday’s speech, “I’m only here because this country gave me a chance through education. We are here today because we believe that in America, no hardworking young person should be priced out of a higher education.” At Scholarship America, that belief is at the core of our mission, and we are honored to have participated in these critical discussions on behalf of students everywhere.